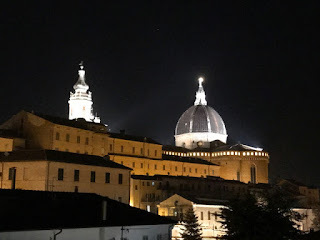 OK it has been REALLY long since I lost worked on this blog. 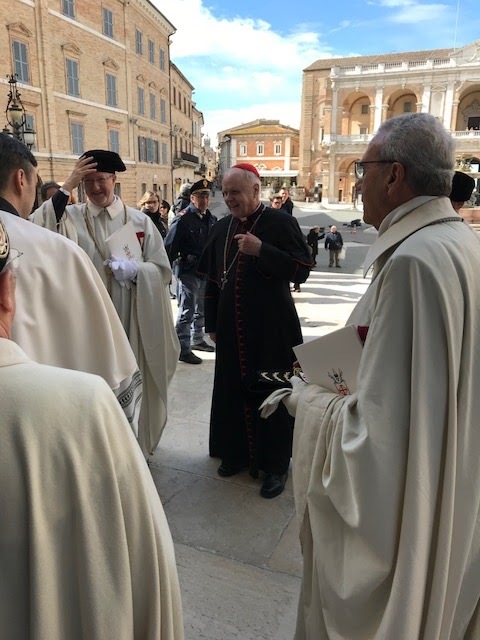 I'm finding the balance between my work with and for Cardinal O'Brien (my primary reason for being here) and school (and a life) to be difficult. 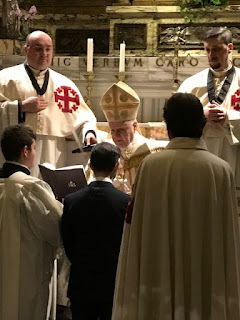 Nonetheless, I'm managing - but there are some things that have had to take a back-seat - like blogging. 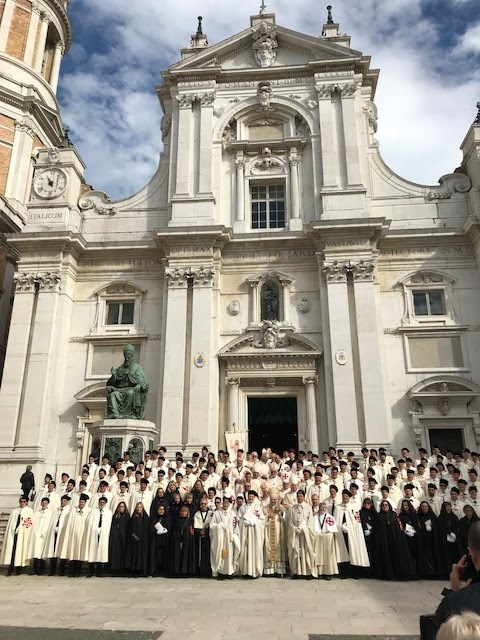 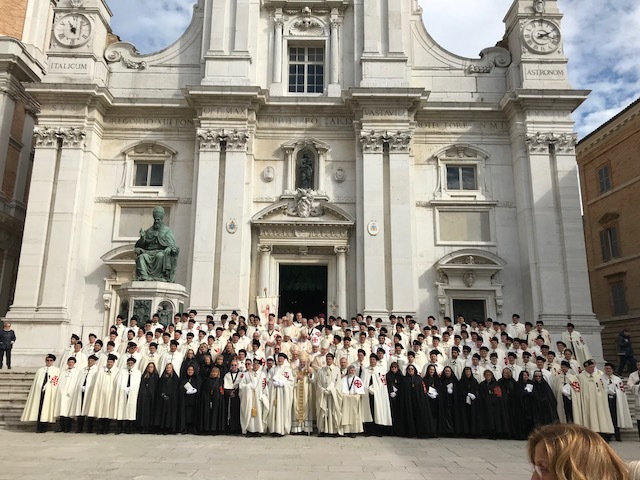 Still, this weekend was a really great investiture in Loreto, so I wanted to share it with you! 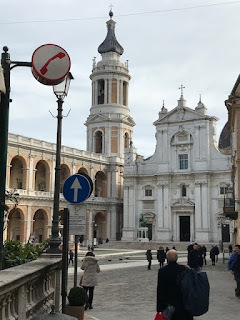 Because Loreto is only 3 hours (or so) from Rome - nearly directly across Italy on the Adriatic Sea - we drove to Loreto. We arrived after dark and had a nice dinner in Loreto - and a beautiful nighttime view of the Basilica's dome. 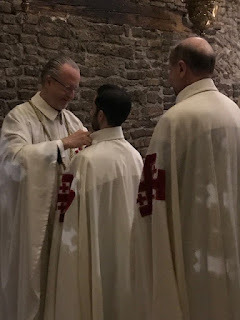 As the Investiture was not until 11:30am, I had the RARE chance to sleep in a bit (although my internal clock awoke me at 6am - still sleeping later than usual). 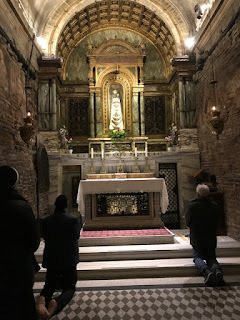 So after breakfast at the hotel I went early to the Basilica so that I could have the opportunity to pray. As I walked toward the Basilica, the view was impressive. 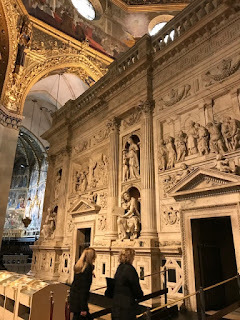 As I went into the Basilica, of course the first place I wanted to go was the "Holy House" as it is called. 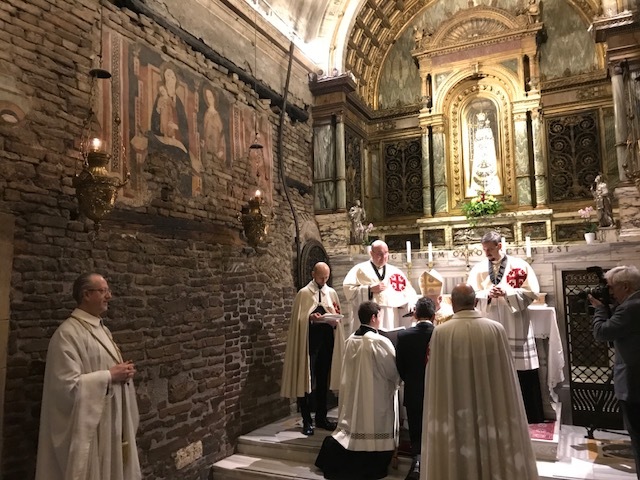 The tradition is that this house was the home of Mary in Nazareth - the home in which she was raised and in which the Archangel Gabriel appeared to her at the Annunciation. 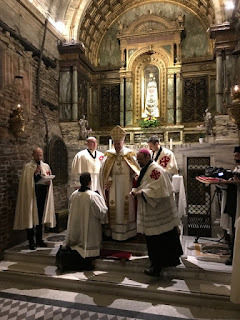 An ancient tradition tells that the walls of the Shrine existed in Nazareth, Galilea: the Holy House is the same House where Our Lady Mary was born, grew up and received the angelic announcement. 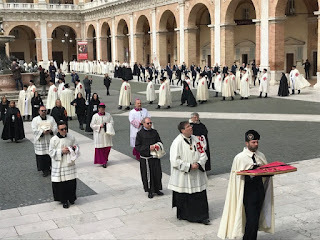 This tradition, based on devotion and popular belief, ascribed the transportation of the House of Nazareth to an angelic mission; current historical studies have developed the hypothesis of a transportation carried out by Man, through sea and land, that came true with special assistance from above. That’s the way “to read between the lines” and give the most probable explanation to the Holy House event. 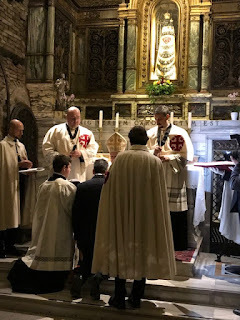 The original nucleus of the Holy House consists of three walls only: in Nazareth, the original fourth wall was simply the side opened towards the entrance of the grotto. On this edge now stands the interior altar of the Holy House. 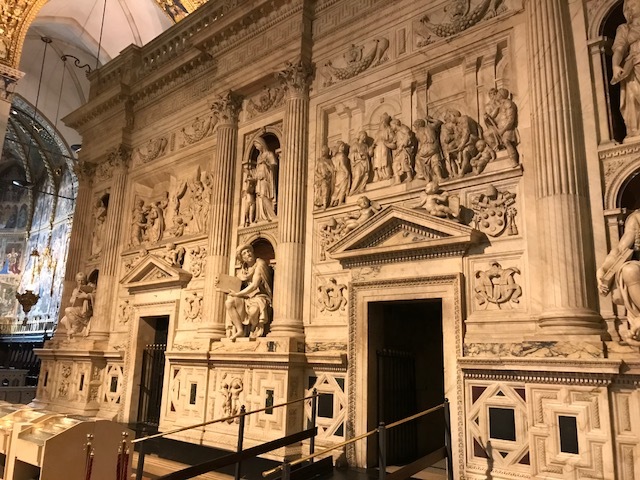 The Holy Chamber can be clearly defined in two different parts. The lower section (from the ground up to almost 3 meters in heigh) is the original wall, made with sandstone blocks, built in regular rows, as we could find in Nazareth; the upper section is added afterwards with Marche local brick, the only building material used in the area with that methods of construction. The technique used for the external finish of some stones is similar to that employed by the Nabateans and was very popular in Palestine during the Romans empire. 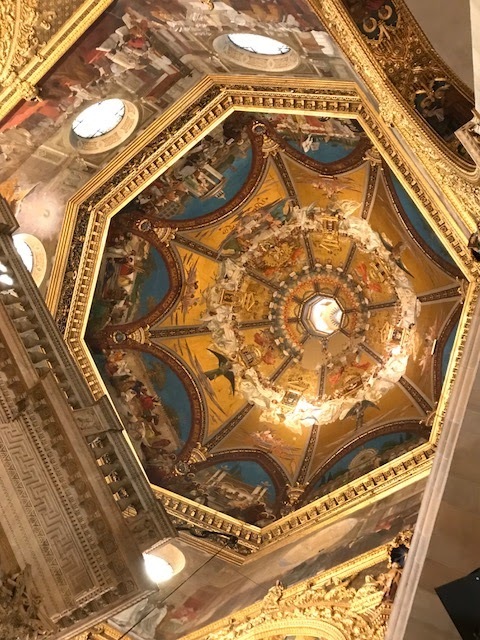 About sixty graffiti have been found, and mostly are considered by experts to be similar to those of the Judeo-Christians in the Holy Land, including Nazareth, belonging to ancient times. 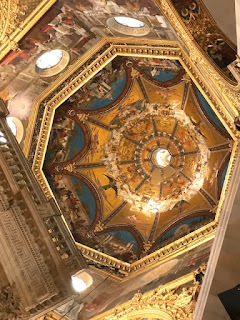 I was able to get some photos of the outside of the Holy House and the interior of the dome before I went to spent some time in prayer before the Blessed Sacrament exposed in the Eucharistic chapel. The Marble Screen was commissioned by Julius II, who sent Donato Bramante to Loreto in 1507 to do "great things" there and to "draw many works". 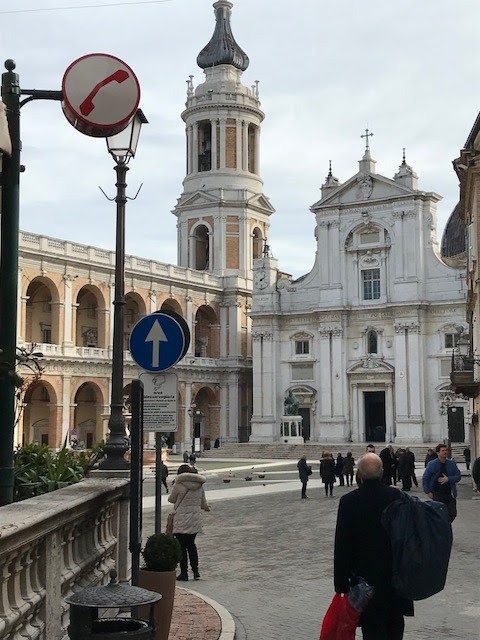 The opera was realized under the direction of Andrea Sansovino (1513-27), Ranieri Nerucci and Antonio da Sangallo il Giovane. 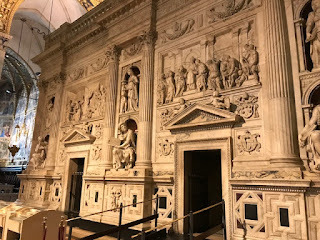 The statues of the Sybils and of the Prophets were inserted in their niches in a later period. The Marble Screen consists of a podium with geometrical ornamentations, with a series of aligned columns articulated in two sections, crowned by corinthian capitals supporting a projecting cornice. The balaustrade, by Antonio da Sangallo, cloaks the ungainly barrel vault of the Holy House and also provides an elegant frame encasing the marvellous edifice. 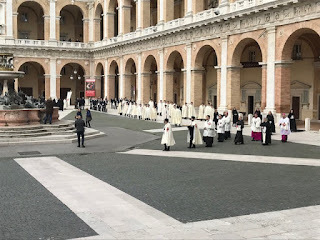 I, and everyone else in the Basilica, was asked to exit the Basilica for 10-15 minutes (which became about 20) while the police conducted a "security sweep." 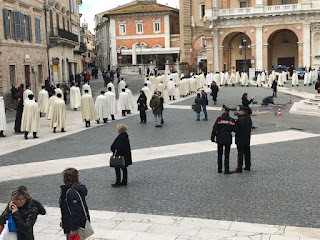 Turns out that the local authorities decided that, with a large gathering of the faithful with Cardinals and Bishops, it might be best to ensure everyone's safety. 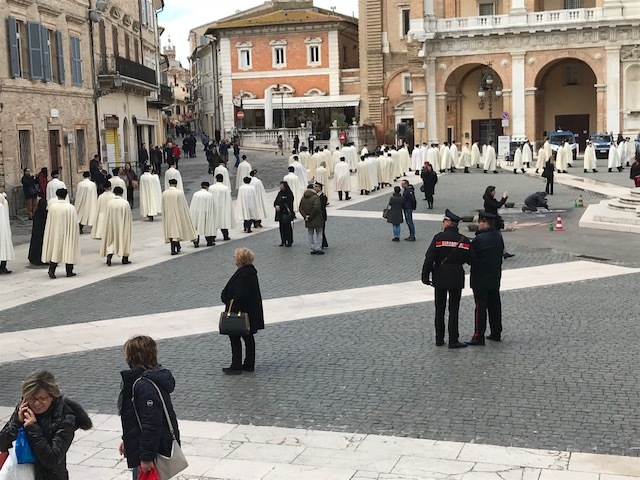 So, it was annoying, but good to know of their precautions for everyone's safety. 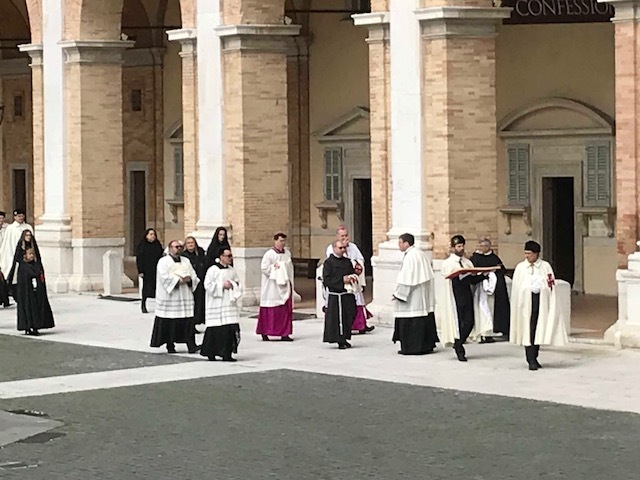 When their sweep was finally completed, I vested and went outside to await the Cardinal's arrival. The church bells tolled, calling everyone to the celebration. I LOVE the sound of bells! 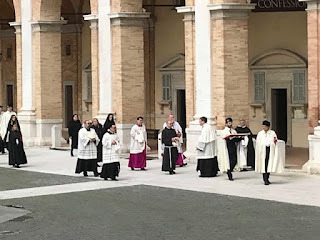 And then the Cardinal Arrived, blessed those greeting him with Holy Water, and entered the Basilica while "Ecce, Sacerdos Magus" was sung (I have just a short snippet - sorry). And with that, everything was ready - the Cardinal vested for the ceremony of Investiture, and we began. 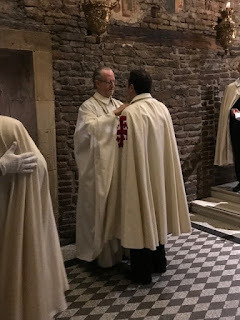 It all went as per usual, until the time of the investiture itself. 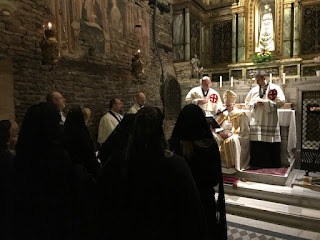 Realizing that we were at the home of Mary from Nazareth, we were given a special privilege - to hold the actual investiture rite INSIDE the Holy House: a piece of the Holy Land in Italy. 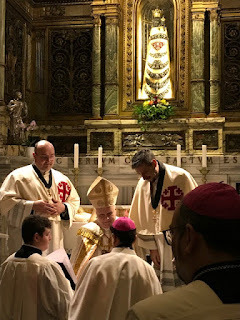 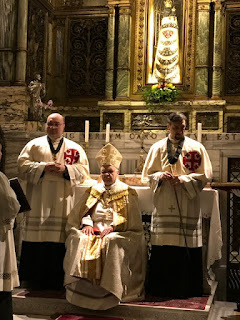 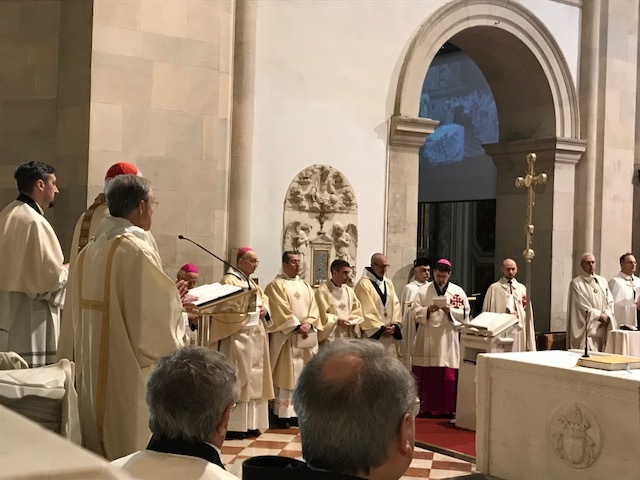 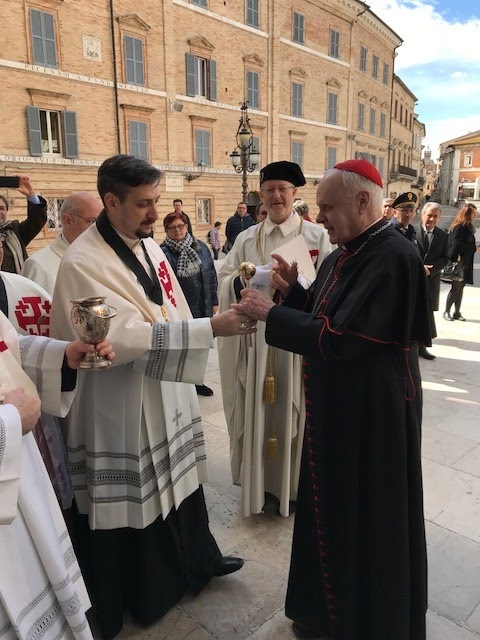 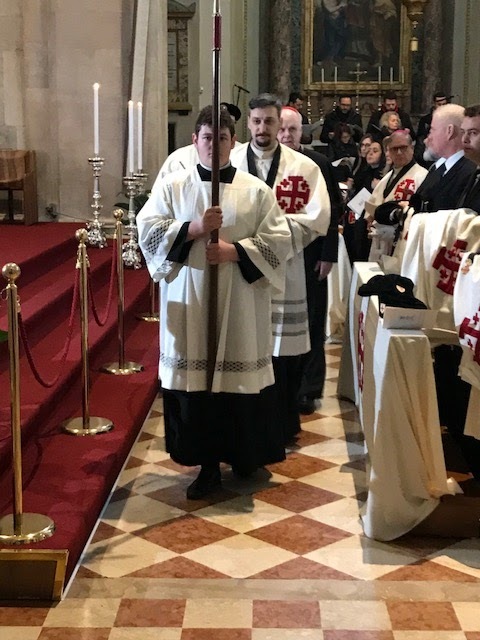 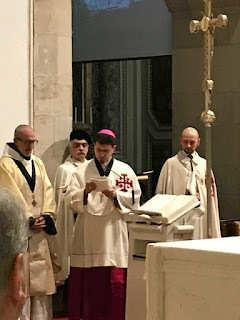 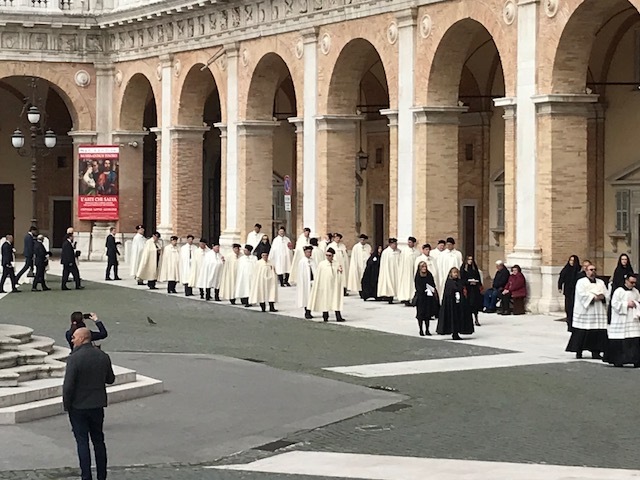 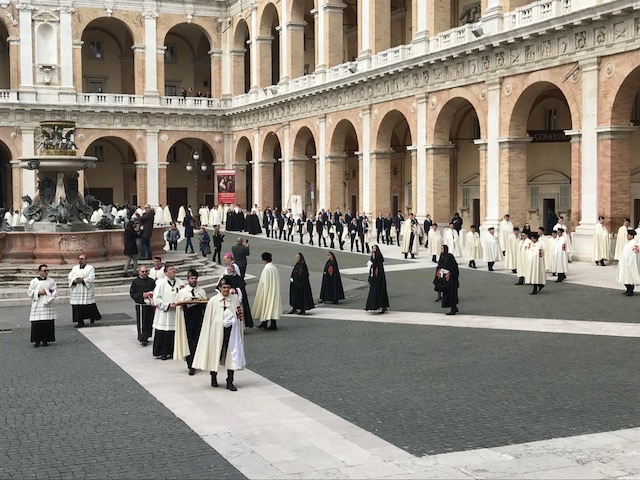 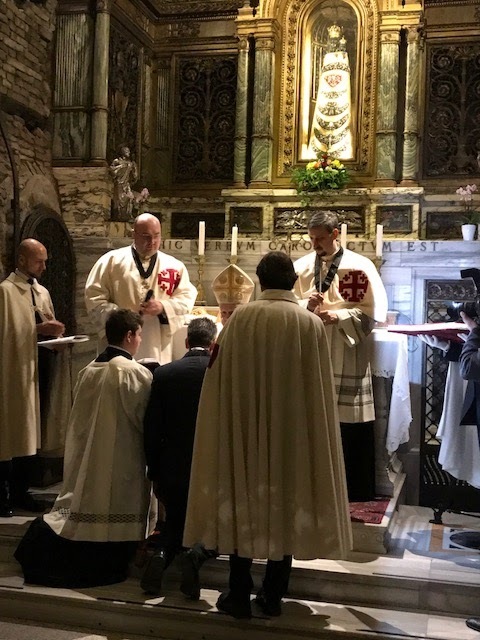 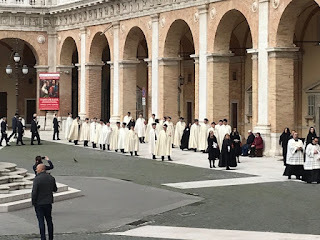 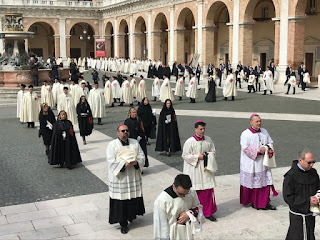 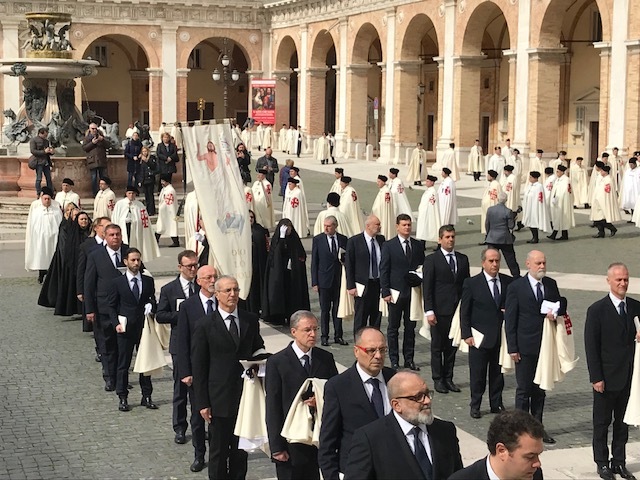 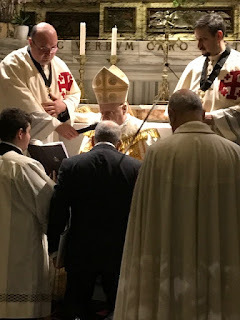 The investitures completed, the Cardinal vested for Mass, returned to the Sanctuary (where he was welcomed by the Archbishop of the Shrine, Archbishop Fabio Dal Cin. 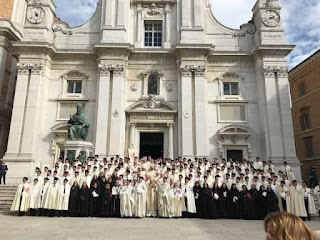 Then the final photos outside of the entire group. 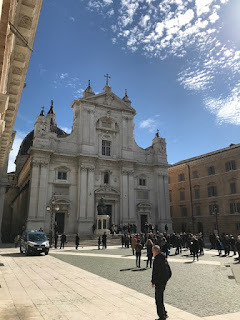 Some day, I will go to Italy and use your blogs as a travel companion. 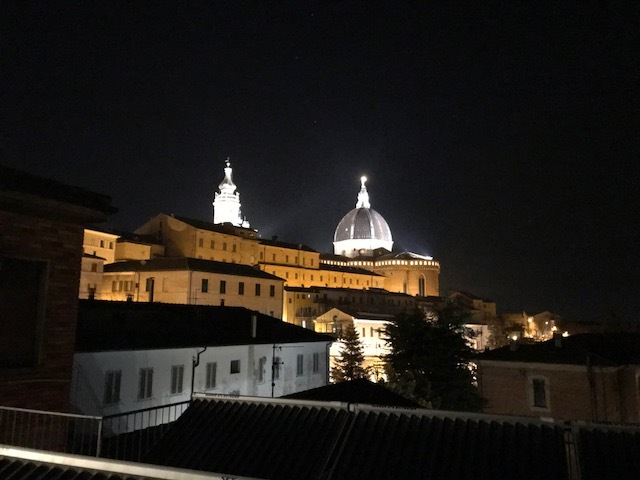 Let us know when you are in Gettysburg the next time.